Often medieval manuscripts, especially those of theological or historical treatises, contain more than one work. This 12th-century manuscript has copies of works by the early medieval authors, Isidore of Seville and Alcuin, on the subjects of goodness and wisdom, along with verses on the eucharist, faith and the Fall. Such a collection would have been read by the medieval monks of Haughmond Abbey as part of their daily program of prayer, contemplation and study of scripture. 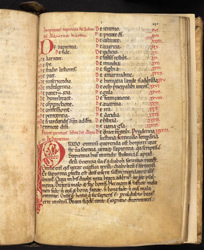 When the reader reached this point in the manuscript, the red double columns would alert him that he had reached the chapter lists, a kind of table of contents, for a new section or another book. The title in larger red script below the lists confirms Isidore's book ends and Alcuin's 'On Wisdom' begins. The life-long teacher, Alcuin (735-804), wrote many important theological works as master at York and Charlemagne's palace school, followed by a final stint from 796 as abbot of St Martin's, Tours. This work on wisdom fits in the themes of the manuscript, which also includes some pages of biblical questions and answers in a 12th-century Irish hand. The whole manuscript has an Irish background flavour, since Alcuin himself was indebted to teachers from Ireland.